As part of our Taiwan trip (more like Taipei trip), we also did an overnight trip to Jiufen. Its magical teahouses, red lamps, narrow streets and mysterious surroundings are said to have inspired Miyazaki for the movie Spirited Away. Keep scrolling for our 2-day Jiufen itinerary which includes lots of food, sights, nature and eeriness! We arrived in Jiufen on a hot afternoon. The bus left us at close to the Old Street and with our heavy backpacks, we pushed through the crowd and food stands and made our way to our accommodation. Which had amazing view over Jiufen – lots of greenery and the sea! After a first shower, we went back in the heat to explore Jiufen, more specifically its temples and cemetery with beautiful tombs. After walking in the heat, taking breaks in temples, and continuously applying sunscreen all over, we took a break at the famous A Mei teahouse. We waited for a while so that we can be stead indoors; there were spots on the terrace but it was way too hot. After waiting, we were seated indoor; in the air-conditioned teahouse, we learnt how to make green tea and enjoyed it over 2 hours with delicious cakes and beautiful views of the sea – ultimately enjoying the sunset. As soon as we exited the teahouse we were hit by waves of tourists cramming to take photos with the lit red lamps and the teahouses around. Even though it was crowded, it still was magical. We quickly headed to have dinner – small teacakes are not a proper meal – to the teahouse of our hotel. When you are in Taiwan you must have hot pot! Delicious boiling broth was cooking our meats and vegetables that we enjoyed with cold drinks. We finished our dinner at 8pm – this did not seem late for us but it sure was. As soon as we finished our meal, we went out and wanted to enjoy the food stands in the Old Street. But to our surprise, it was all closed down and empty. The street that was once brimming with tourists and delicious foods was now empty and haunted, with the lit red lamps guiding your way. We figured out that the food stands are following the schedule of the day tourists. Our second day had amazing weather – meaning it was rather chilly, windy and cloudy. It was a bit humid, as it rained the night before; but I loved it compared to the scorching heat we had the day before. We started our day with breakfast overlooking the sea and Jiufen, enjoying the fresh air and the sounds of nature. We continued by exploring and eating a lot at the food stands that were open. After stuffing our faces, we caught the bus visit Jinguashi and its surroundings, including the Gold Ecological Park and the Gold Waterfalls. We walked a lot but thanks to the cloudy and cold weather, it was way easier than before. After exploring beautiful and eerie village of Jinguashi, we headed back to our hotel to pick up our luggage; on the way back to the bus station, I had one last snack – fresh matcha ice cream mochi. 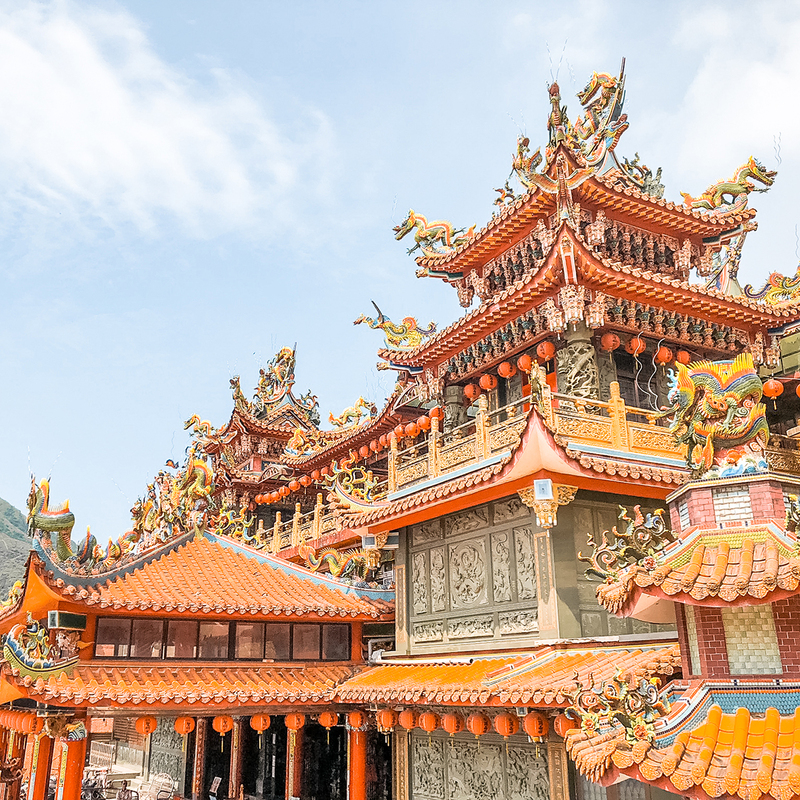 I hope that you have enjoyed our 2-day Jiufen itinerary; I truly hope you will check it out, should you visit Taiwan one day! Stay tuned for more detailed posts on the Jinguashi Gold Ecological Park and what to eat in Jiufen! Don’t forget to check out the post with my first impressions of Taipei! Taiwan is a beautiful place to visit! There is so much to see and do. It looks like a really beautiful drive and your pictures make me crazy and Now I’m planning to explore it. Thanks a lot to share.